IF there is one reality that defines Pakistan’s media consistently across seven decades, it is its commercially powered growth. In 70 years it has mutated in quantum stages to multiple levels. The pen that used to be mightier than the sword has become a nano-chip-powered lightsabre. Today the media is very different from the entity that lived and breathed through the printed word alone. In the 1970s or ’80s, when I was struggling to find my voice, Pakistan Television monopolised the airwaves, and the print media’s message was refracted to literate, if not educated, elites. At that point, its power and scale were both at another platform. Despite being controlled and smaller in scale, the mission statement was about telling truth to power, not brokering it. As we speak, in its new electronic or digital avatar, the media is inside our living rooms, our smart phones and our heads. It is often the persistent voice bombarding us with information overload and shrill opinion, or the quiet algorithm curating and culling what we read in the digital world. Not all the changed hard-wiring is entirely sinister, or a conspiracy to strip readers and viewers of choice and knowledge, but certainly a darker labyrinth to navigate. It wasn’t always like this of course. The journey from newspaper to television to the social media, all vying for space in a crowded information environment took a few decades, but it brought the spectrum light years away from its vintage days as I like to call it. As a budding journalist myself in the pre-private channel days, I am grateful that a high learning curve was literally forced on one, as was the ability to build context and to try and locate the story behind the headline. The political landscape was not complicated for those who spoke out or fought authoritarianism. After 1977, for 11 long years when General Zia dictated Pakistan’s big choices, despite the political darkness, the beacon-call of values confronted every decision. Every era demands its own clarity and courage, but to me this one felt like Pakistan’s darkest night. The line between political activism and professional journalism often blurred at the press clubs. As a budding journalist myself in the pre-private channel days, I am grateful that a high learning curve was literally forced on one, as was the ability to build context and to try and locate the story behind the headline. There was always tension between the media and government, the owner and the professional. Like any media in the world, Pakistan’s too always walked a tightrope between its mission statement and its business plan. There were many definitions of what the media was supposed to do. Yet in the moral universe we inhabited, outside the shadowy world of yellow or paid journalism, we all had rough agreement on one rule: that the media was supposed to be a watchdog for the public, holding both a mirror to society and making government answerable. To many of my heroes who plied the tradecraft, it was a calling, not just a smart career choice. Much of that changed when two things re-defined Pakistan. One was controlled democracy, which as a form of government was restored in 1988, but remained hostage to a strong civil-military establishment axis that still wielded constitutional power to dismiss elected governments. This dynamic by itself changed the nature of the state’s relationship with the media. As governments eased back on restrictions, cacophony often replaced checked content. In the best cases, courageous rites of confrontation with dictator-led regimes were replaced by investigative but also other less robust types of mainstream reporting. Largely, in the absence of publicly shared facts, as covert policy-plays and information famines became the norm, the media reports that gained most currency were the ones that predicted different outcomes. In this context of serial uncertainty, the media changed. It became a site for endless speculation which it has refined to a lesser art to this day. The other big change that re-tooled the Pakistan media was the opening up of the licensing regime for the air waves which broke the state monopoly on television with permissions to air for the BBC, the CNN and a local private channel. These baby steps should have heralded incremental change, which would have perhaps tempered growth with quality. Instead, another dictator, this time Pervez Musharraf, in an attempt to buy favour with the media, opened the floodgates to TV channel licenses without regulating the business. Media houses that could once only run a few newspapers grew into cross-media juggernauts, empires that small independent media could not hope to challenge for resources. Flash celebrity journalism replaced the daily slogger. In the space of one decade, Pakistan’s media turned into a huge window of social and political churn. While remarkable changes in Pakistan’s media have transformed its vast axis and peripheries, to my mind, at its core sits the professional journalist, who still fights a daily battle for survival. From the dangers of frontline reporting, both in traditional war zones and complex urban battlegrounds, Pakistan’s battle against violent extremism has re-set the terms journalists have to ply. Thousands of journalists have become a statistic in the roll-call of silenced voices. Ironically, high risk has brought with it a new breed of valour. With self-censorship in such a predatory, unprotected environment where the battlefield can be anywhere, the truth could have become a terrible, endangered casualty. But it hasn’t, because the urge to out the real story behind the muffled one still excites many journalists. Today the bodycount and bloodspill of the Pakistani media ranks high in international metrics for professional bravery. Counter-intuitively, the fragility of a life in journalism is much higher than it was in times where the state was the only repressor. While remarkable changes in Pakistan’s media have transformed its vast axis and peripheries, to my mind, at its core sits the professional journalist, who still fights a daily battle for survival. At no point in our history, though, was any media house a temple to abstract virtue. In the pre-television days, the media was often or primarily a business, and, equally, a bargaining chip for power. Yet even as a commercial venture, or pathway to power, the proprietor, as the owner was known, was conscious of the nature of the business. It was never a widget or tool-factory. The newspaper traded in ideas, information, and, at best, knowledge. It had to embrace values or reject them every single day. Ethical, moral choices over what to print, or what not to print, defined a professional’s daily universe. The choices are made even today, except with a difference. Today, unlike before when policy was a yearly discussion between editor and owner, the new normal for red lines between the executive and editorial have totally blurred. 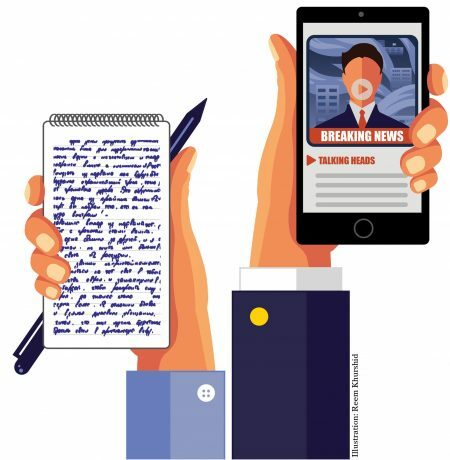 The average proprietor sets the daily terms of engagement for news content. Exceptions, like the Dawn, maintain separation of powers, but largely the owner-editor is a phone line away, where advice from various places informs output. Global trends don’t help. A new frontier of alternative facts and ‘post-truth societies’ set at least my teeth against the digital leash that allows truth to become real just because it is repeated enough. But hope, like data, springs eternal. The good news is that the truth like this cliché, is always out there, even if only in analogue reality, and there are journalists who clearly know that it must not become fungible like money. A story or news show may spurt its froth, but the core will find its hydraulic way to the surface, even if it is coloured. The dangers of modern-day televangelism, though, is a whole different op-ed. This article appeared in Dawn on November 04, 2017.